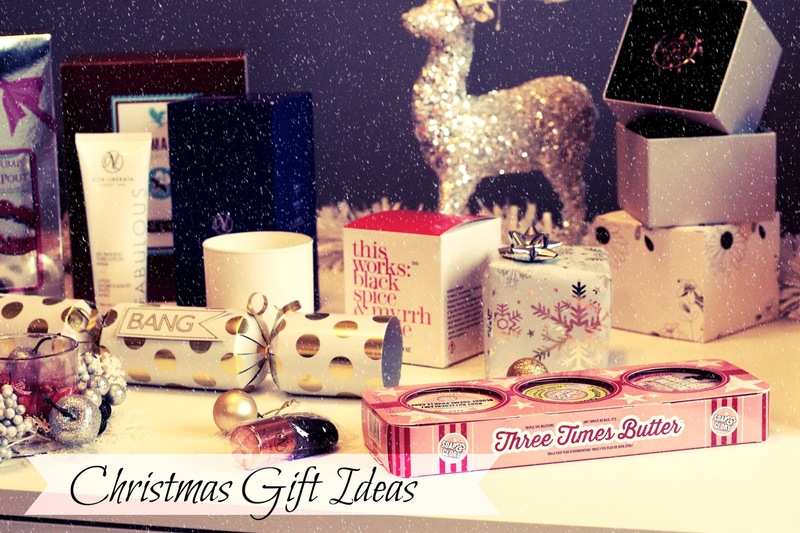 It’s getting closer and closer to the big day and you may still be searching the net for that perfect gift after being paid for the final time of 2015... Well, let me help you a little bit by showing you a few gifts that will be perfect for her this year. Some very affordable and others a little more deluxe to make her feel special on Christmas Day! 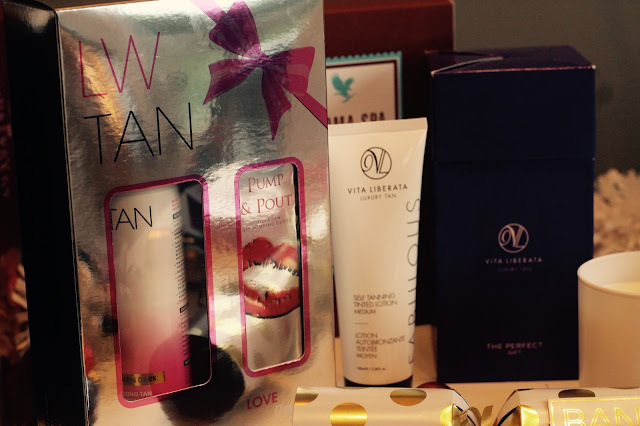 For the Fake Tan lovers out there, there are some fabulous gift sets available this year and I have two of the best tans you can get - Laurens Way Tan have a gorgeous gift set which includes a Tan Moose and a Pump and Pout lipgloss which has collagen in to help plump up those lips ready to go and kiss under the Mistletoe! You can buy this from Laurens Way online for £22.95 and you also get to choose either a medium or dark tan! 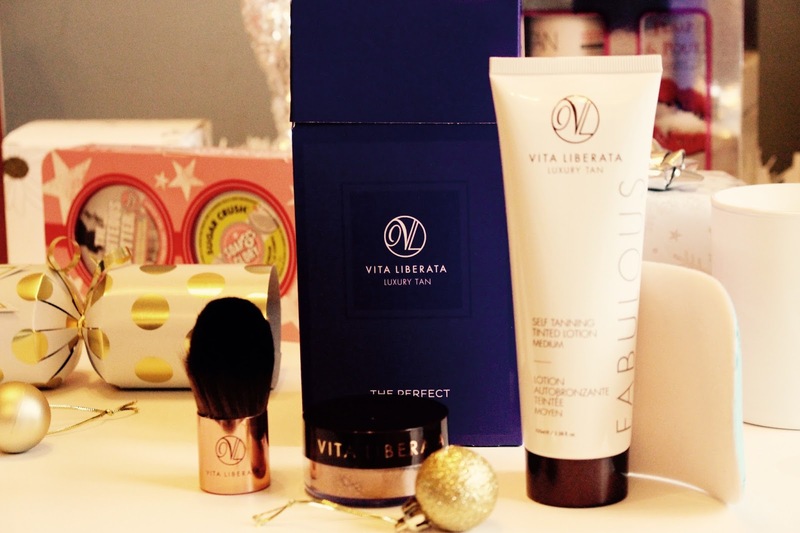 If you’re more of a Bronze and Go type of gal, the Vita Liberata Party Glow Set includes everything you need to get party ready this christmas with a Tan, Mitt and even bronzing powder with a lovely little kabuki brush too! Vita Liberata are one of my favourite tanning brands so this would be right up there on my Christmas list! You can buy this for £29.50 from Vita Liberate online . For the bath and body lovers out there, a must from the amazing brand Soap and Glory - this year there’s a cute little trio of their body butters. 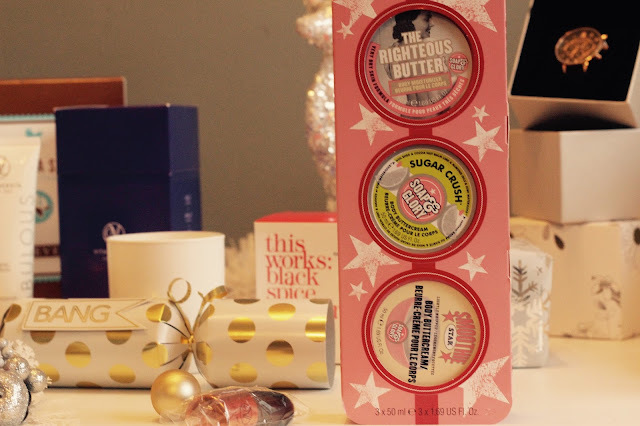 Get 3 of their top selling body butters; The Righteous Butter, Sugar Crush and The Smoothie. 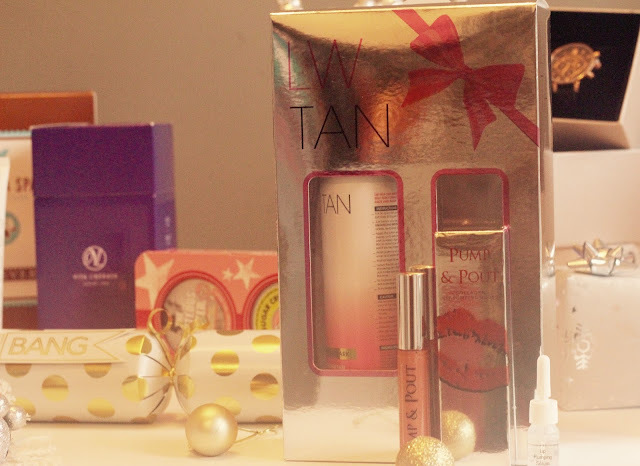 Get this fabulous trio for just £8.00 from Boots - a perfect stocking filler too if you’re buying one of the tanning sets!! 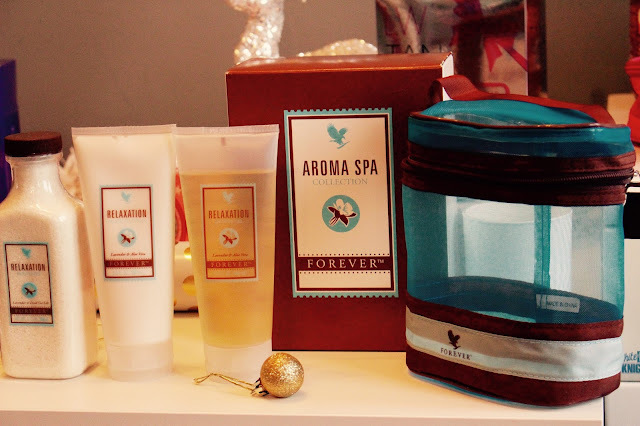 If you know someone who loves to pamper themselves with long baths then the Aroma Spa collection is the perfect gift. A gorgeous, luxurious gift set including Bath salts, Massaging lotion and Shower Gel means that if ever you need to escape and treat yourself, you can do it from the comfort of your own home. 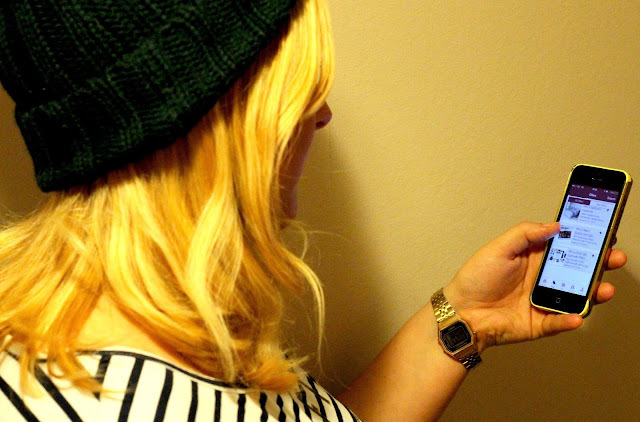 Team up with a face mask and a good book and you’ve got the perfect evening right there. It also comes in a lovely wash bag that can be used again and again. Onto the other gifts... 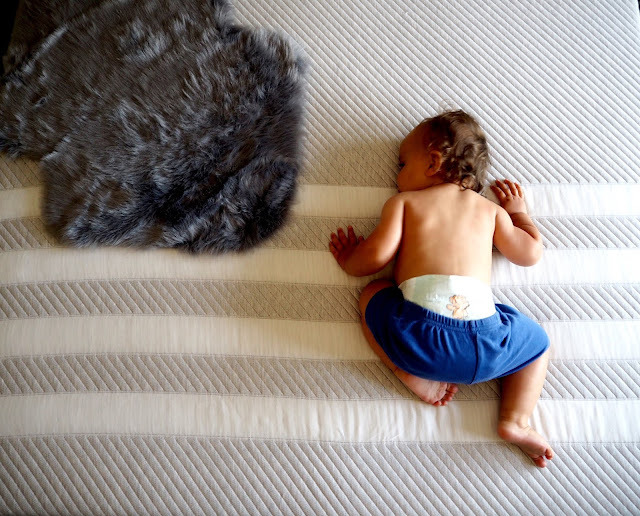 Perfect for any age, anyone and even yourself! 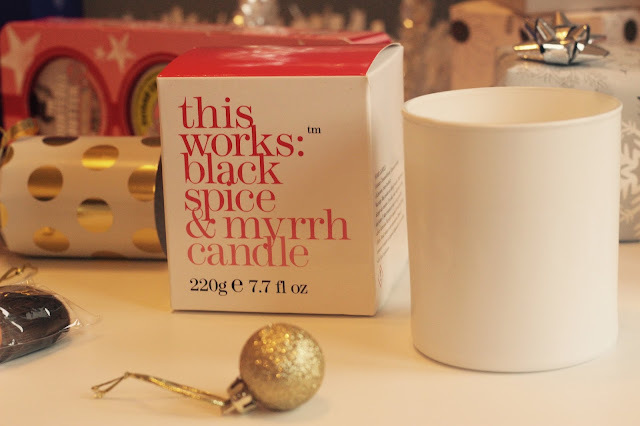 This Works have a lovely range of candles out at the moment and I managed to pick this one up in TK Maxx a few days ago - there were another 4 scents but this is the most Christmassy of them all. It has a lovely warm scent, perfect for winter and is so soothing. For just £12.99 (RRP £25.00) this is another perfect stocking filler or secret santa gift! And for the final addition to this gift collection, the perfect Rose gold watch. 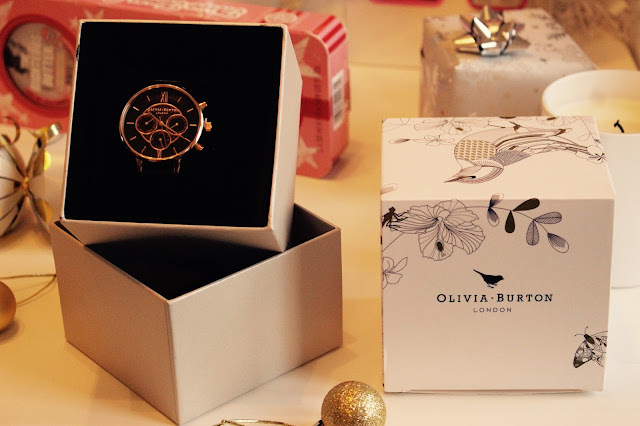 Olivia Burton have some absolutely stunning designs and if you know someone who deserves to be treated, get them a beautifully designed OB watch. 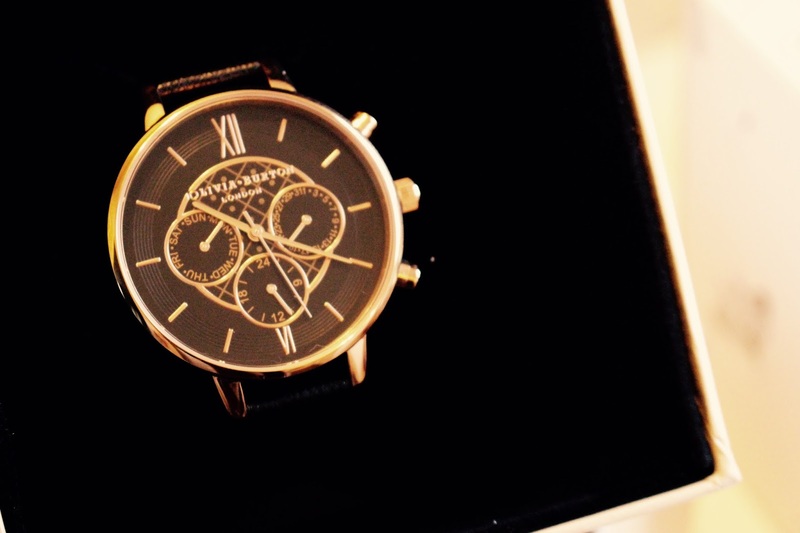 This one is Rose Gold detailed with a Black strap and is the perfect size. It’s not too chunky and it’s quite feminine but without being too girly - you can buy it for £135.00 on Joshua James and also get 10% off your first order! Most of these stores are shipping out until the 22nd so you still have plenty of time to get them ordered or even treat yourself if your presents are bought and wrapped! I know i’ll be buying a few more of these for myself ready for January to help me feel less crappy about the fact i’ll have no money and Christmas is over for another year! If you have any questions, feel free to ask me over on Twitter! It’s finally here… the build-up has lasted all year for me, but it’s finally Christmas! I adore this time of year, I’m not sure whether it’s because I have to wait all year for everything to happen in a week - Christmas, birthday and New Year’s celebrations – but I know for a fact that it’s definitely the best time of year for me, weather permitting that is. Exploring the Christmas market and getting caught in traffic full of Christmas shoppers – that’s what it’s all about! So, how much more of an excuse do I need to go and buy a new party outfit for this season’s festivities? - Classic – think LBD’s and sophistication, a little glitz maybe to make things sparkle or even a jumpsuit, take the tux to the feminine side! 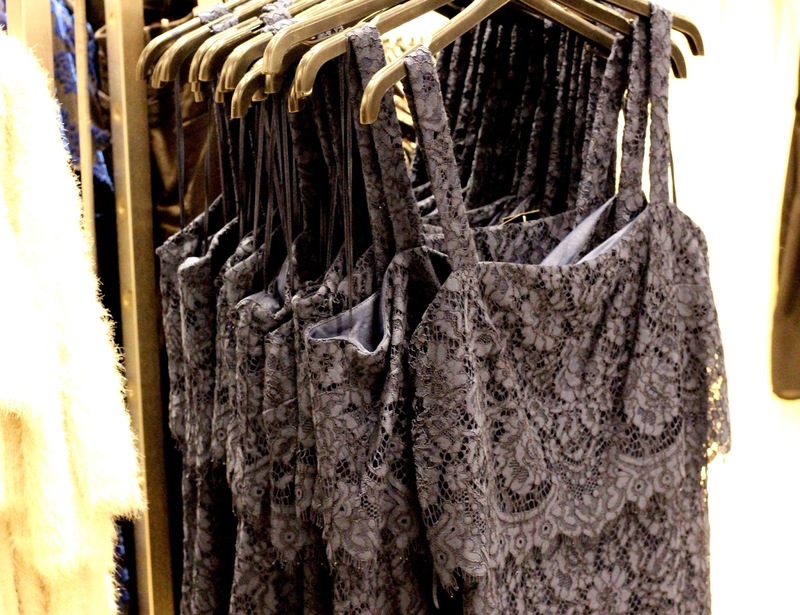 - Romantic – all about velvet and black lace. 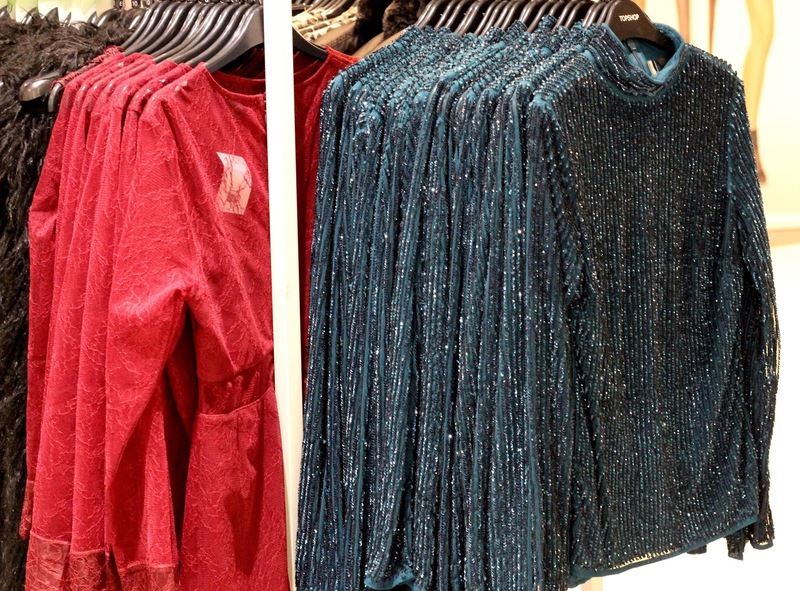 Think of long sleeves, tights and high necks too, teamed with a glitter eye and dark lip! 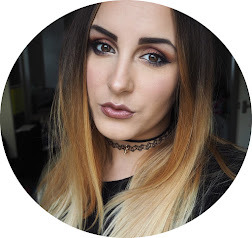 - Rock ‘n’ Roll – sequin dresses, chunky boots and lots and lots of eyeliner! - Minimalist – keeping it simple with slip or shift dresses with cuffs and collars and some cute dolly shoes! - Disco – the best of them all; glitter, colourful faux fur, big shoes and bigger earrings! I had a slight plan in mind as to where I wanted to go as I used the Highcross PLUS app, available on iTunes or Google Play, to locate shops and find offers before I left and so with New Look, Topshop and Debenhams to be my first stop offs, I made my way there immediately! I love how the shops are open late too, every night of the week they’re open until 8pm which means for people who finish work late, like me, there is still chance to avoid the weekend rush and there’s no queuing for changing rooms either! New Look has some amazing pieces in right now, lots of black lace dresses and lots of glitter and sparkle too! 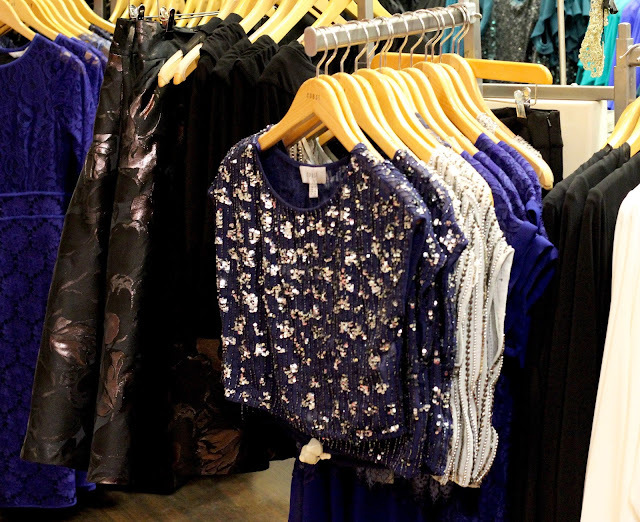 It has a fabulous range of party wear this season, I think possibly the best range out of all the shops I went into – I actually ended up buying 2 dresses from New Look as I couldn’t decide which one I liked more! 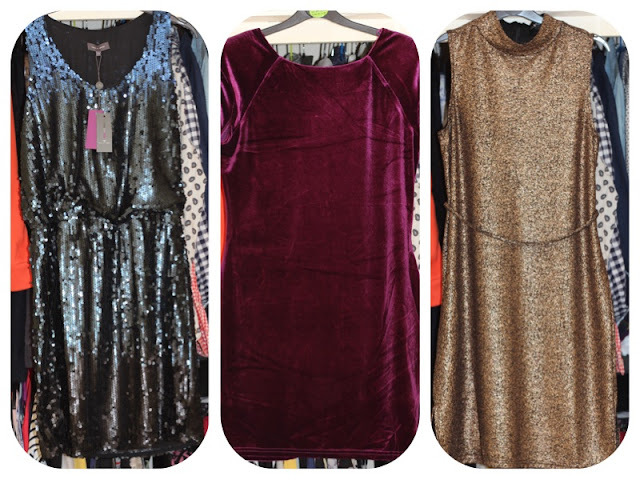 I went for a romantic-styled, shoulder-padded, purple velvet mini-dress which I plan to pair with some opaque tights and some black heeled boots, and also a gold and black high-necked dress which is slightly rock ‘n’ roll and slightly disco- styled! With a successful trip to New Look covered, next up was Topshop. 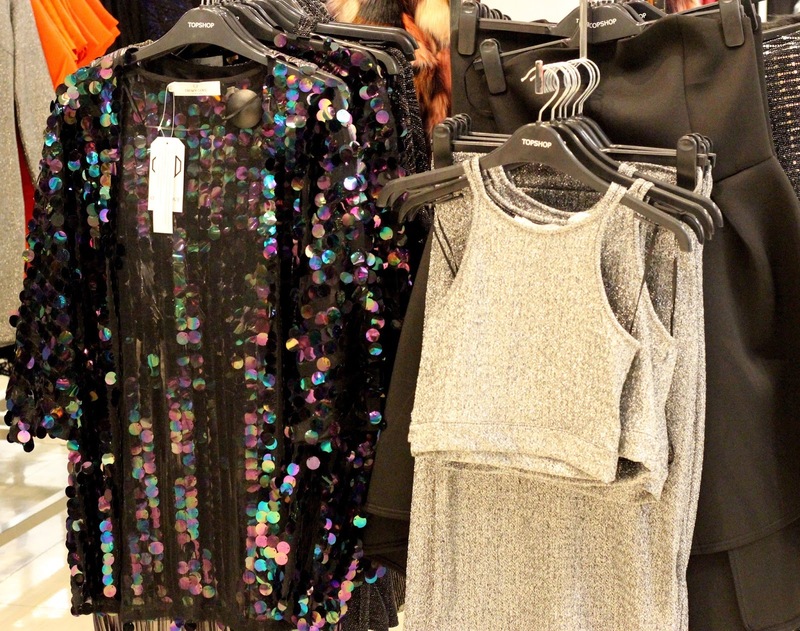 With another great range of sequined tops and dresses and also a couple of lovely trouser jumpsuits, I found it difficult to pick something out that I liked just as much as the dresses from New Look. 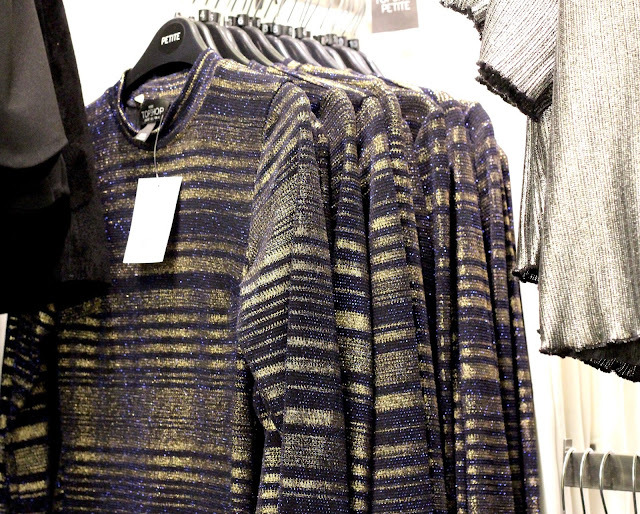 However, I did stumble across some lovely, sparkly jackets and faux fur cover-ups which would go perfectly with any party dress! Making my way over to Debenhams, listening to the Christmas songs being played and watching the Christmas lights twinkle around me, I searched through the Highcross PLUS app to see if there were any discounts on food. 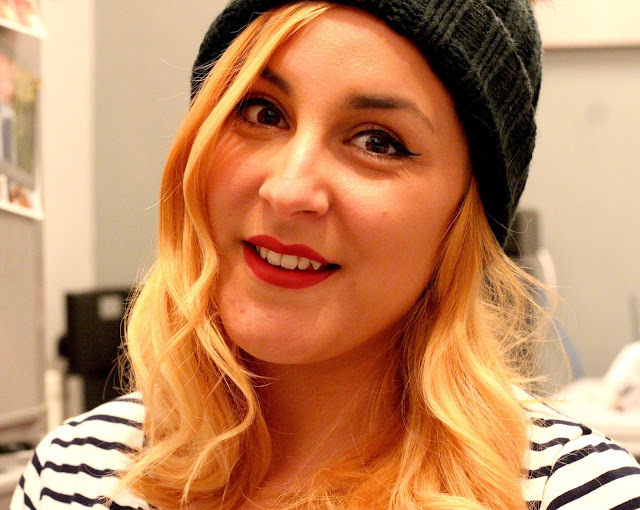 I had come straight from work and wanted a quick bite to eat – I popped into Patisserie Valerie and used the offer on the app that got me 2 FREE macaroons when I bought my coffee! Yum!! 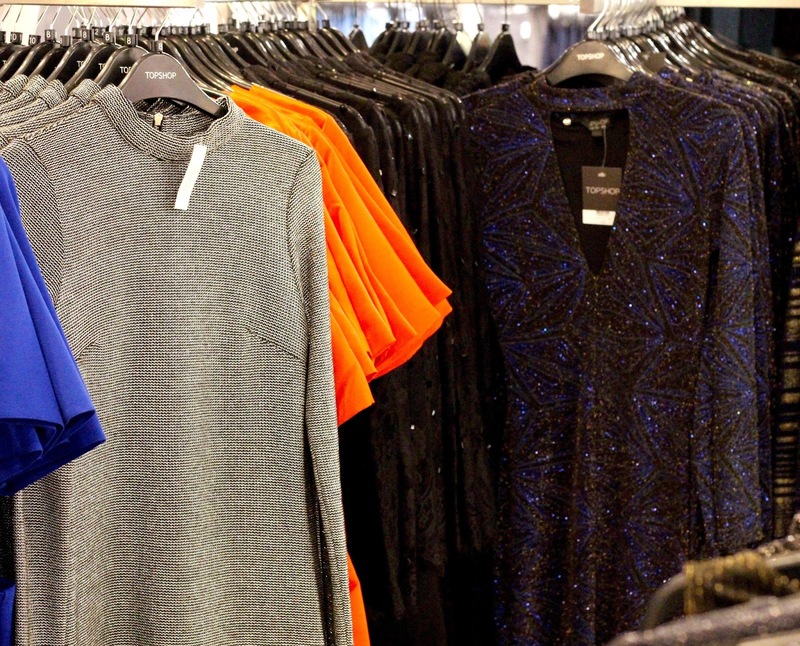 So, once in Debenhams, I was a little overwhelmed with the amount of outfits they had, in a good way of course. 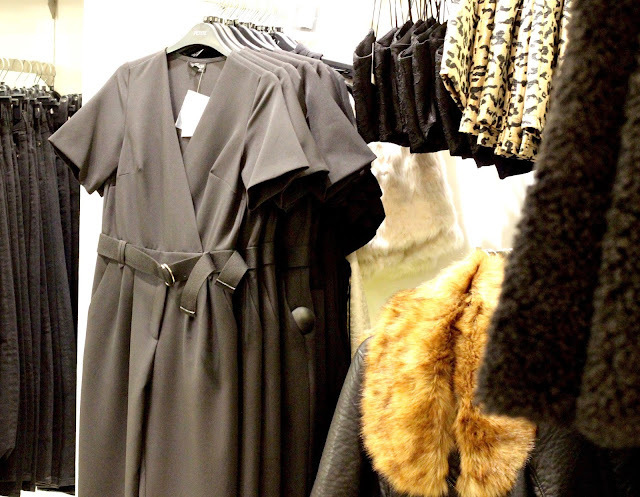 The great thing about Debenhams is that there are loads of brands in the same place, so rather than going in and out of shop after shop, the best items are all there ready and waiting! Every dress or jacket you can imagine was in Debenhams with some lovely evening gowns for a more formal party and some super cute mini dresses for the New Year celebrations that will last all day! Imagine yourself wrapped in a lovely velvet dress with a lavish throw and some gorgeous make-up – get it all in one place too, which means more time to browse and try everything on! I did come across a gorgeous little sequin dress though and I had to have it – a ridiculous reduction in price made it all the more exciting too!! With so many gorgeous party pieces around, why not make this year the most stylish holiday season to date? What are you waiting for? 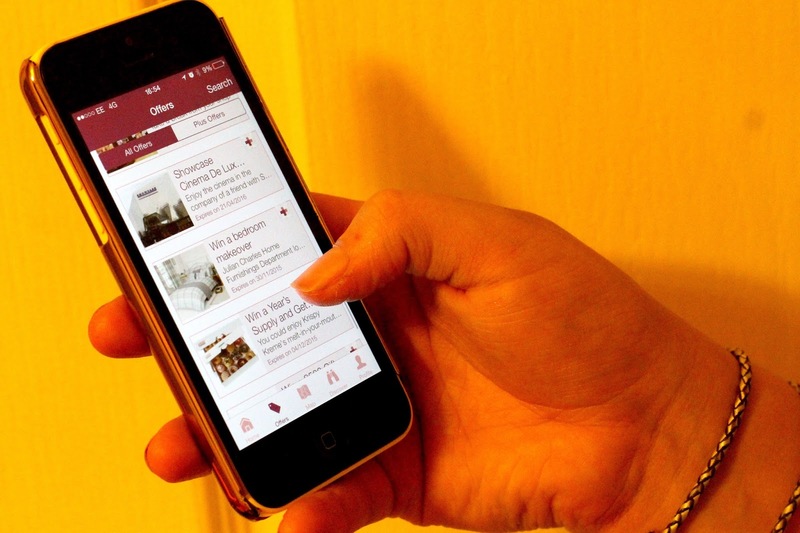 But don’t forget to download the Highcross PLUS app, available on iTunes or Google Play, before you go and take advantage of some amazing offers!